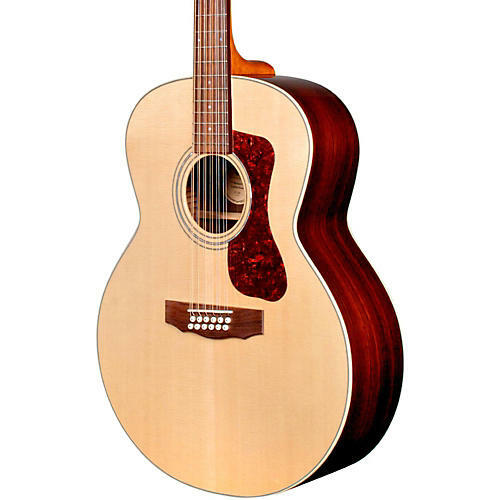 The F-1512E combines two of Guild' most iconic specialties: twelve string and jumbo guitars. With their large, rounded bodies, jumbo acoustic guitars have been Guild' forte since 1954; combining this shape with the ever-popular 12-string construction results in a full-toned, impressively voiced acoustic instrument. A powerful Fishman Sonitone pickup adds an extra boost of amplification to this Guild classic. Built with a solid Sitka spruce top and solid Indian rosewood back and sides, the F-1512E also features an Indian Rosewood fingerboard and bridge, NuBone nut and saddle, and mother-of-pearl rosette. This model also has a 1 7/8 nut width on a vintage shaped Guild neck, iconic Chesterfield headstock emblem reminiscent of 1960s Guilds, period-correct tortoiseshell pickguard, and Guild' new lightweight polyfoam case. Available in Natural gloss finish.